The demand for good health and wellbeing is on the rise, as is the competition among PHARMACY CHAINS and more…the progressive liberalization on medicine sales are rapidly changing the field, weakening the pharmacy in its role as a primary health front. All over the world the demand for medicine has increased so much so that governments are no longer able to support people’s needs. Pharmacies are destined to stand on their own two feet in the future. Competition when it comes to price has brought down hundreds of pharmacies (independent and chains) all over Europe. The drugstore model that was started in America with Wallgreens, replicated all over the world is a clear sign of this. GDO attracts customers less and less, Amazon beats Wallmart, bankruptcies and closures are on the increase. “Reselling” is destined for failure if one doesn’t know how to give value to the BRAND and offer products and services in a UNIQUE AND DIFFERENTIATING way. The combination of online sales and a host of increasingly strong and structured products being available on the market is progressively responding to the demand of mass market health and wellbeing products. Independent pharmacies, independent or chain drugstores, herbalists, health shops, large-scale retail, perfume shops, even fitness and health centers are much more well-informed when it comes to their customers individual and personal needs. A NEW MODEL THAT CAN MAKE YOU STAND OUT, COMMUNICATE, ATTRACT AND INVOLVE IS FUNDAMENTAL. DIFFERENTIATE FROM THE COMPETITION. Advertising and selling products in multinational companies has increased their brand value, NOT THE PHARMACY CHAINS who HAVE CONTROL OVER THER BUSINESS. Pharmacy chains don’t do anything in order to grow the brands they sell, they rely on the politics and the products of multinationals. What would happen if Pierre Fabre (Avene, Galenic, etc.) decided to sell exclusively online? The case of Toyota who sold 50 samples of the Aygo at 25% less than Amazon is a pretty big deal! What would happen if the competition chose to continuously lower prices? Everyone wants to be happy, be more efficient and productive. Thanks to the internet, A CULTURE OF HEALTH IS BEING SPREAD which is why nowadays there is a new type of client: a very well-informed customer-patient. We all want to be content and so we look for the best information regarding our health and wellbeing and that of our nearest and dearest on the internet. We must be ready for this new type of client or we risk losing them altogether. How do we embrace the change and turn a new page creating a sustainable business that brings profit? Pharmacy Chain Boost™ is the first ever professional pharmacy sales system! What does “professional pharmacy sales system” mean? The truth? If you are having trouble selling more in your pharmacy it is because, up until now, you have not considered the importance of learning the right sales methods for pharmacy chains and you have blindly believed in these false premises! What you need is a system studied exclusively for pharmacy chains that works and that can be easily applied by your colleagues (a characteristic that ALL real sciences share), thanks to which you will finally be able to get your business soaring! 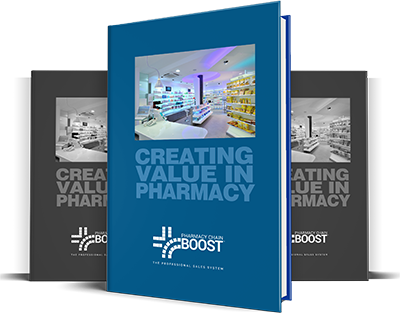 This system is appropriately named Pharmacy Chain Boost™ and its strength is based on the FACT that it has been created to guarantee profitable and professional sales in pharmacy chains. Pharmacy Chain Boost™ is NOT the hundredth motivational or pseudo sales course, led by people who have never run a business in their lives (and never will). To reiterate: sales in pharmacy chains is a SCIENCE that has precise rules that can be learnt! Pharmacy Chain Boost™ is the means by which with simplicity and clarity, you can become a true master of the scientific method (tried and tested) that will allow your business to really take off. … Even though we are facing a difficult period of change, and without you having to cut your prices. Trust me! The choice is yours. You can carry on doing what you always have done…watching your pharmacy chain’s profits stagnate or worse, decrease. You certainly can’t expect anything else if you simply carry on doing the same thing, can you? If you want to put the turbo on your pharmacy chain and have a huge advantage over your competitors, then you have to apply a truly professional sales system of pharmacy chains! ==> Click here for more information! Experta has chosen ®Easy chain, the smart eco-friendly display system by Sartoretto Verna™ for their first flagship store in Turin.